Role: To teach sports to school students within the local community to help them improve their skills and general fitness. 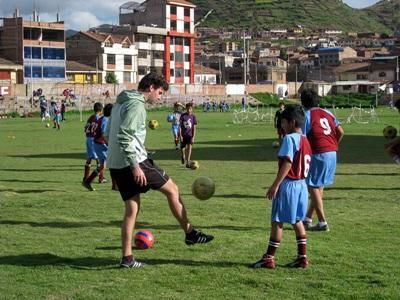 Help develop the sporting talent of the next generation by volunteering on our Multi-sports programme in Peru. Volunteers do not need to have any previous experience; you simply need to have a love of sports and enjoy working with children. As a volunteer on the Multi-sports project, you can choose to focus on one of the following sports: basketball, football or volleyball. Your role will be to help local children to develop their athletic ability, build confidence and encourage teamwork. You will be placed at a partner sports academy and assist sports coaches who provide training to students. Depending on your placement, age of the children and your ability to lead a team, you will have the opportunity to run your own training sessions with the teams, under the supervision of the local coaches. Volunteers will be responsible for preparing a schedule of activities and setting goals for the students to reach. Classes can be anything from organising fitness sessions for a small group of children, coaching advanced football skills to teenagers, to running a basketball competition and educating children on sporting principles. Football: If you choose to coach football, you will split your week between two different partner placements. Class sizes range from around 6 – 15 students. Children are generally divided into groups: beginner, intermediate and advanced, depending on their age. This project runs year-round. If you are an experienced football coach, there may be the opportunity to work with a high-level team at an elite football academy for players aged 12 – 16. Basketball: Volunteers will coach children between the ages of 8 – 17 at local basketball academies or sports clubs. There are around 40 children in a class. This project runs year-round. Your working hours are from 3:30pm – 6pm. Volleyball: As a volleyball coach, you will work with students between the ages of 6 – 16 at local sports clubs. There are around 12 – 30 children in a class. This project runs year-round, and your working hours are from 3:30pm – 6pm. Volunteers also have the opportunity to introduce and coach activities such as gymnastics, ping pong, cycling, and swimming, depending on your interests and experience. You can join a Multi-sports project in Peru for two or three weeks if you don't have time to join us for four weeks or more. This project has been selected by our local colleagues as being suitable for short term volunteering for both the host community and the volunteer. Although you will gain a valuable cultural insight and work intensely within the local community please be aware that you may not be able to make the same impact as someone volunteering for a longer period.